A Recessed Wall Standard is a great way to create crisp, clean looking displays on your wall displays or custom floor fixtures. Recessed Wall Standards provide a sleek look, with only the slot channel visible and the rest of the standard installed within the wall. Create your ideal wall or custom floor fixture display using a Recessed Wall Standard and Recessed Wall Standard hardware, such as shelf brackets and hangrail brackets. Palay Display is your one stop for Recessed Wall Standards. If you cannot find the right Recessed Wall Standard, please chat online or call one of our knowledgeable representatives who will assist you with your Recessed Wall Standard questions. Palay Display has been supplying store fixtures since 1945! The Recessed Wall Standard is an important item to have for a variety of store displays. The walls of your store are a very large area of selling space. Use that space economically and efficiently with the Recessed Wall Standard. Recessed Wall Standards are a great way to create crisp, clean lines in your store fixture displays. Try a Recessed Wall Standard for your wall displays and your items for sale will stand out nicely. If you can't find the right Recessed Wall Standard, please chat online or call one of our knowledgeable sales staff who can assist you. The Recessed Wall Standard is a great way to start if you are trying to create an upscale wall display. Add in accessories and other display fixtures and watch your sales increase! 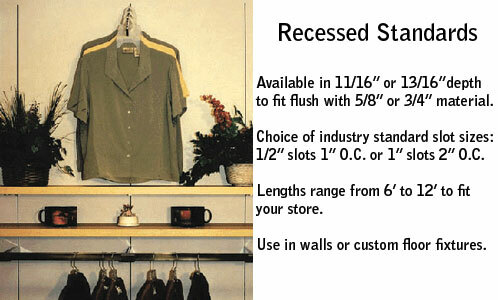 The Recessed Wall Standard is a smart choice for your retail environment. Recessed Wall Standards work well in a variety of retail settings such as boutiques, childrens stores, specialty shops, and more. Make use of a large area of selling space by using a Recessed Wall Standard to complete your display. If you can't find the right Recessed Wall Standard, please chat online or call one of our knowledgeable sales staff who can assist you. The Recessed Wall Standard is a simple and cost effective way to set up your store display. Using a Recessed Wall Standard is an efficient way to use valuable sales space on your walls. Try a Recessed Wall Standard today! The Recessed Wall Standard is a great way to set up displays if you have limited space. The Recessed Wall Standard gives a seamless, clean look to complement all your store display fixures. If you can't find the right Recessed Wall Standard, please chat online or call one of our knowledgeable sales staff who can assist you. 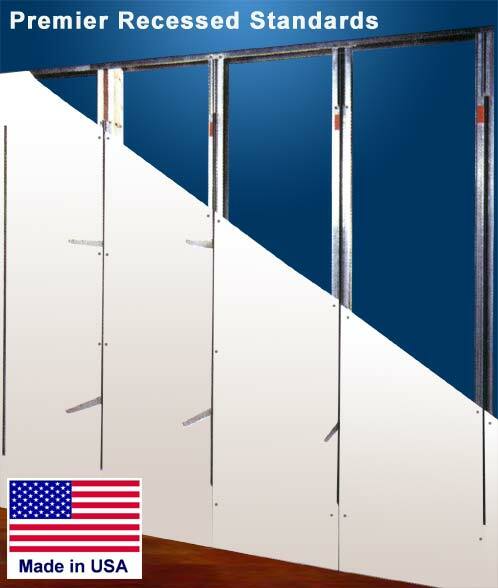 The Recessed Wall Standard, part of the Perimeter Hardware section, is a very important item to have for a mixture of different store fixture displays. Recessed Wall Standards are economical and efficient, making it a cost effective way to increase sales. If you can't find the right Recessed Wall Standard, please chat online or call one of our knowledgeable sales staff who can assist you.